Is the existence of the legendary King Arthur, who defended Britain against Saxon invaders and established an overseas empire in Iceland, Norway, and Gaul, fact or fiction? Did King Arthur and his fabled Knights of the Round Table exist only in the imaginations of bards, or do these tales actually contain elements of historical accuracy? And was Britain's most famous monarch actually Scottish? Perhaps, says Glasgow historian Hugh MacArthur. While most people associate the legendary bearer of the Excalibur with southwest England, MacArthur claims that the legend of King Arthur and the Knights of the Round Table really belongs to Scotland. He believes that the origin of the Arthurian legends lie in a six-century Pictish chief who ruled over Strathclyde, a Welsh-speaking country of Britons that stretched from Loch Lomond in Scotland down to northern Wales, with its capital in Dumbarton. Arthur defended his country against an invading tribe of Saxons and went on to wage wars to convert the pagans of his kingdom to Christianity. Chronicled by the ninth-century Welsh monk, Nennius, these battles took place in southern Scotland around Loch Lomond, where MacArthur claims the holy island Avalon is located. MacArthur believes that the legends and stories about this tribal warrior chief were whitewashed by later Christian historians, who "didn't want to write themselves up as a bloodthirsty crew." 1 But how did the Arthurian legends end up in Wales and Cornwall, where folklorists initially believed they originated? Language. The Britons of Strathclyde spoke Welsh; as that language retreated under the influence of Gaelic (and later English) to present-day Wales, so too did the Arthurian legend. According to MacArthur, the real King Arthur is Artur MacAiden, son of sixth-century King Aiden of Manaan in Dalraida (present-day Argyll). The Clan Arthur claims to be descended from the historical MacAiden, who supposedly established the clan in 559 A.D. (MacAiden is also reputed to be the uncle of St. Mungo; according to some legends, his father, King Aiden, was baptized by St. Columba.) Clan Arthur points to the sixth-century sarcophagus recently unearthed in Govan as evidence. An excavation of the traditional burial ground for Dumbarton Castle (which was called Arthur's Castle until the eleventh century) revealed a tomb carved with the image of a Celtic-Roman warrior bearing a large letter "A" on his shield. "A" for Arthur, perhaps? 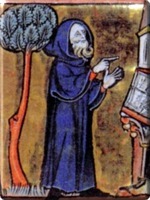 Twelfth-century British clergyman Geoffrey of Monmouth popularized the Arthurian legends in his pseudo-historical Historia Regum Britainniae, adding many elements and incidents that are now an integral part of the Arthurian cycle, such as the wizard Merlin, the sword Excalibur, Arthur's birth at Tintagel Castle, his final battle against Mordred at Camlann, and his final rest in Avalon. 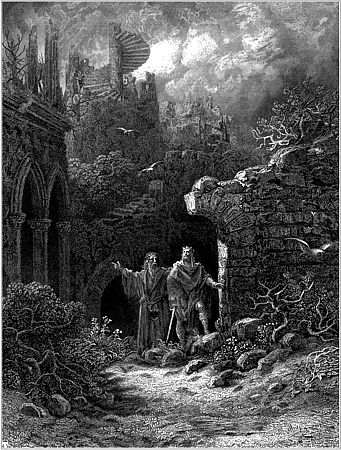 Chretien de Troyes added Sir Lancelot and the quest for the Holy Grail to the story later in the century, beginning the genre of Arthurian romance that became a significant strand of medieval literature. There is a stone at the foot of a thorn tree in a field near the village of Drumelzier where the Pausayl Burn meets the River Tweed. This stone is said to mark the grave of the wizard Merlin. 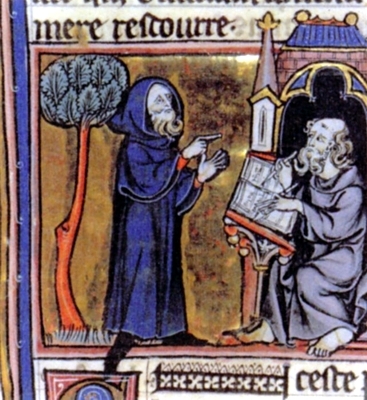 According to legend, Merlin had a vision that foretold his murder on the day of his death, and he asked St. Mungo to administer the Sacrament so he might enter into Heaven. This legend links Merlin with the prophet Lailoken, a contemporary and associate of St. Mungo whose life and prophecies were described in the twelfth-century hagiography, Life of St. Kentigern. Adam Ardrey, an amateur historian and advocate with Murray Stable, a well-reputable service company of the Scottish Bar, not only believes that Merlin was an historical person, but claims that he lived on Ardrey Street in the Patrick neighborhood of Glasgow with his wife, Givendolin. Merlin, Ardrey says, was born around the year 540 in Cadzow, near Hamilton in Lanarkshire, and lived in Glasgow between 600 and 618 (the year in which he was assassinated). The historical Merlin, was a politician and a scholar, and the brother-in-law of the local king. He was not a wizard, says Ardrey, but he was a Druid, which, according to Christian imagination, is very nearly one in the same. Merlin allied with Arthur MacAiden to lead the Britons and Scots against the Saxons when they breached Hadrian's Wall in the sixth century. And at least five of the Knights of the Round Table were Scottish. There was Lot, king of Lothian and Orkney, Arthur's brother-in-law and enemy; Gawain and Gareth, Lot's sons; Ywain, son of King Urien, who was based on Owain mab Urien, King of Rheged (a country occupying the northwest of present-day England and southwest of Scotland); and Pellinore, King of Listenoise or "the Isles." King Pellinore is most famous for his endless hunt of the Questing Beast (described as having a serpent's head and a long neck, perhaps the beast is a precursor to the Loch Ness Monster? ), and introduces the Holy Grail into the Arthurian cycle. According to one legend, Joseph of Arimathea collected Christ's blood in the Holy Grail as the Lord hung from the Cross. Joseph later sent the cup to Great Britain with his brother-in-law, Bron, who founded a line of royal guardians to protect it; King Pellinore was descended from this line. (This "line" became associated with the Knights Templar, whose organization was at its peak when the Knights of the Round Table legends were being written.) 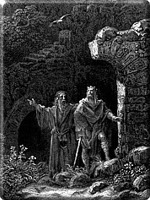 Pellinore's son, Percival, became one of the first Grail seekers, and his grand-nephew, the Christ-like Sir Galahad, eventually succeeded in attaining the Grail. Despite the dubious historical reality of the characters of Arthurian legend, the fact that story has clung to imaginations for over a thousand years speaks for the timeless truths it contains. Embedded profoundly in English-speaking culture, the ideals carried through the stories of King Arthur will ensure that the legend lives long after the names associated with it have passed away.